book_fountain has no other items for sale. Description They say you should never trust a skinny chef - but what if that skinny chef held the secret to losing weight without compromising on foodie pleasure? 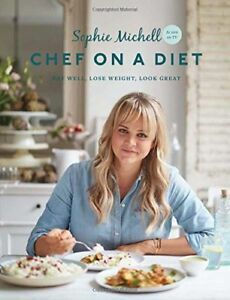 In her new book, executive chef Sophie Michell reveals the recipes she herself has used to lose weight despite spending all day, every day, surrounded by food. Sophie has developed this diet with an emphasis on flavour, so you'll never feel like you're missing out, even as you drop the pounds. The recipes have been carefully formulated to provide you with essential proteins and nutrients, and will leave you you full of energy, with your taste buds satisfied and your body slimmer. With everything from smoothies and juices to brunches, packed lunches and impressive yet achievable mains, this diet allows you to really embrace your love of food. Enjoy a breakfast of Avocado and Chipotle Frittata, a dinner of Crisp Duck Wings with Miso Glaze and Kimchi Salad, and an array of tempting sweet dishes such as Hazelnut and Dark Chocolate Cake.The recipes are so tasty you'll want to keep cooking them long after you reach your goal weight, helping you to maintain it - as Sophie says, a successful diet is 'a life choice, t something you endure to lose the pounds. ' With the focus on flavour and enjoyment rather than calorie counting, it's time to diet like a chef.